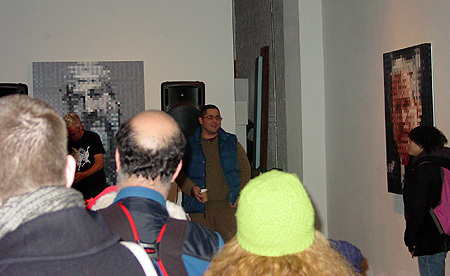 Panoramic view of Aron Namenwirth's art opening at vertexList, Brooklyn, NY. Midway between bin Laden and Bush, gallery proprietor Charles Beronio introduces Glomag, preparing to play a Gameboy music set to the left of bin Laden's beard. The show's meticulously painted acrylic on canvas imagery in a Warhol meets Chuck Close by way of Yahoo! vein also includes the future President and (gulp) Secretary of State. The title of the exhibit is "Made in U.S.A." That's what we do these days--gin out imagery of political celebrities to frighten or amuse the world. The icons exist in endless feedback loops--one such eddy is internet thumbnail --> painting --> art exhibit --> photo --> internet thumbnail. Eventually we may get things back on track and stop leading the world in the production of simulacra but this show bears witness to our current predicament.